The Moon occulted Venus this morning. I took some pictures, tweaked their brightness and contrast, and glued them together. This was a bit tricky due to the fact that the sky was fairly blue when I took them, and it was hard to focus. 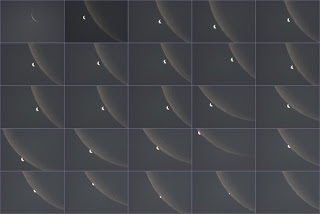 The pictures were taken over a 17 minute period from 6:00 AM to 6:17 AM MDT. All were shot at ISO 400. The first picture was taken with a 560mm telephoto lens at F/8 (the crop factor of the EOS 40D makes this roughly equivalent to a 900mm lens), with a shutter speed of 1/100". The rest were taken at ISO 400 through my 12.5" F/6 telescope, with a 2X Barlow lens, making the effective focal length 3800mm and focal ratio F/12 (6100mm equivalent with the 1.6x crop factor). Shutter speed was 1/50".